Naval Surface Warfare Center test firing in January 2008. When will railguns be put on actual warships? 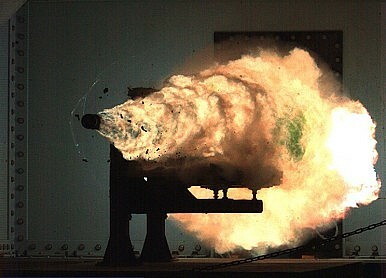 Given the global proliferation of guided-missile technologies and the ever increasing costs of defending against them, the U.S. Navy has put high hopes in the development of directed energy weapons systems, such as electrically powered electromagnetic projectile launchers (aka rail guns). This new weapons system is capable of firing an aerodynamic shell at speeds of Mach 7.5 (5,700 mph /9,200 km/h) and having a reach of 110 nautical miles (126 mi / 203 km). With neither explosives nor propellant, rail guns rely only on electromagnetic forces to destroy an opponent. However, despite the hype, progress in acquiring this new weapon system has been slow. We’ve got a laser weapon now in the Arabian Gulf, we’ve got a rail gun under development. We’ve got some gee-whiz scientific stuff going on. Part of my job, part of our job, is to get those from the lab to the warfighter quicker… That rail gun, we’ve been working on that since the eighties; we’re gonna put it on a ship and test it next year. However, there are no signs that rail guns will enter the Pentagon’s acquisition process anytime soon. For example, the Naval Sea Systems Command — the navy’s principal ship builder — is seeking a “multi-mission rail gun weapon system to support detect, track, and engagement of ballistic missiles and air and watercraft threats,” by 2018 and an on actual warships by 2025, USNI News reports. One of the biggest advantages of rail guns over traditional naval missile defense systems is the low price tag: some interceptor missiles can cost up to $11 million, whereas an electrically powered electromagnetic shot costs a mere $35,000. Targets that can be engaged with the new weapon include large warships, swarm boats, various aircraft, all types of missiles, and land-based military installations. Not only do the weapons require a tremendous amount of power — sometimes in short supply on naval vessels — the rails want to pull themselves apart every time the weapon is fired. In addition to the power requirements and the engineering task of keeping the weapon whole, the Navy also has had to develop a system to quickly pulse the energy through the rails to gain the velocity needed to reach supersonic speeds. Can the Littoral Combat Ship Really Put an ‘Enemy Fleet on the Bottom of the Ocean’? Two U.S. senators think that the US Navy is overstating the capabilities of the Littoral Combat Ship. US Navy’s Fleet of Littoral Combat Ships Will Be Cut to 40 Vessels What Can the Middle Ages Teach Us About US Naval Strategy? US Navy Secretary: We Will Have Over 300 Ships by 2020Drone Swarms: How the US Navy Plans to Fight Wars in 2016 How Many Attack Submarines Does the United States Need?